The only gunsmithing and repair manual published on the new style Colt D.A. Revolvers. 100's of crystal clear photos and illustrations. Click here for a sample page from the book. Covers troubleshooting & problem solving, parts inspections, and the complete repair, rebuilding, and timing of the Colt J, V & AA Frame Revolver models (Mark III through Mark V Series) including: King Cobra, Trooper III, Trooper V, Official Police III, Lawman III, Metropolitan Mark III, Officers Model Match, Peacekeeper, and other Colts with similar lockwork. 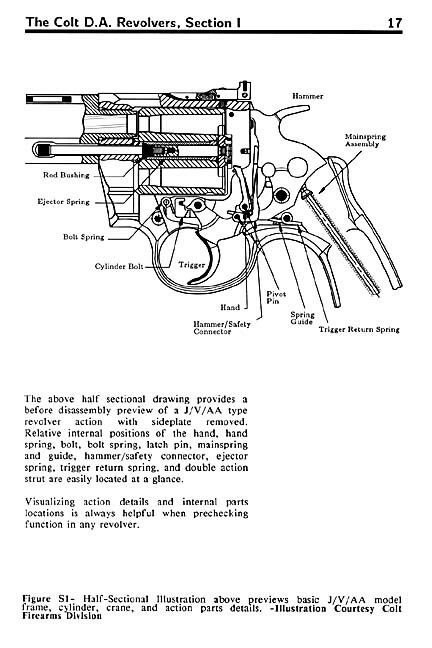 The author places special attention on new style design features; differences between certain Mark III and Mark V parts; interaction of the hammer, firing pin, and safety connector; cylinder bolt fitting and the importance of smooth trigger return; correct cylinder rotation, and cylinder bolt drop. Provides a wealth of practical information on the new style Colt D.A. revolver actions. Although some parts are different, the theory and fitting procedures in this book generally apply to the later large frame Colt Anaconda models. Bench edition - 156 pages with soft cover. $27.95 U.S. See order form for domestic shipping options.